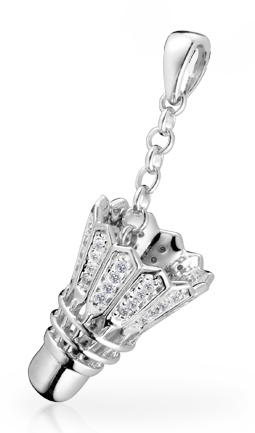 The stunning Badminton All-Star Shuttlecock Pendant features a full crown of diamond encrusted ‘feathers’. In total, the ‘feathers’ contain 50 small diamonds. The Badminton All-Star Shuttlecock Pendant is available in 18-carat yellow gold, 18-carat white gold or 925-silver. The pendant attaches to a necklace via a small gold/silver chain. This gives the shuttlecock a natural free-flowing movement.